As a new school year begins, your child will most likely have a new teacher. With a new teacher comes a new opportunity for your child to learn the academic and personal skills important for school - and beyond. These can also be used to help parents consider how their child's educational needs are being met at school. The teacher's capacity to motivate and engage the class is vital to your child's journey this year. "Motivation" refers to children's inclination, interest, energy and drive to learn, work effectively, and achieve their academic potential. "Engagement" is the behaviour that accompanies this inclination and energy. The Motivation and Engagement Wheel is a useful way to understand your child's motivation and engagement. 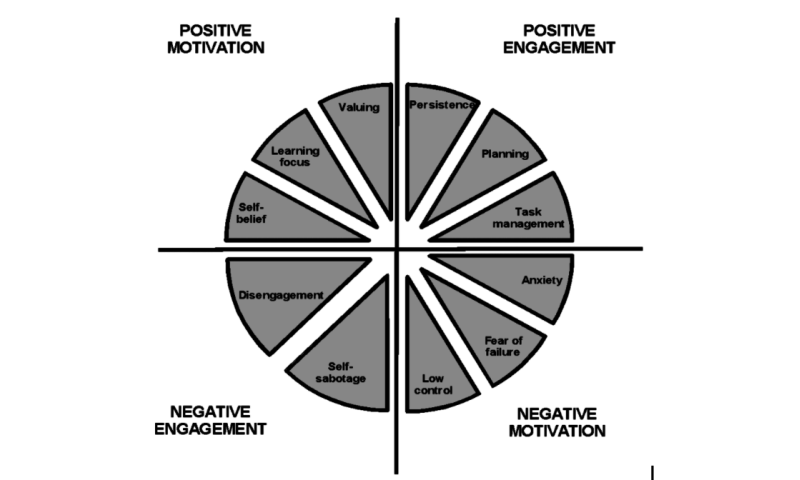 The Wheel comprises positive motivation (self-belief, valuing of school, learning focus), positive engagement (planning, task management, persistence), negative motivation (anxiety, fear of failure, low control), and negative engagement (self-sabotage, disengagement). It can be helpful in identifying and sustaining specific motivational strengths in your child. It can also be used to target specific areas that might need further assistance. The teacher's task is to help support your child's positive motivation and reduce your child's negative motivation. In this coming year, your child will experience academic setback, difficulty, and adversity. How your child deals with academic adversity is very important. How the teacher helps your child work through this adversity is also very important. Research has identified two types of academic adversity. The first type is low-level or everyday adversity. All children experience this. Examples include struggling to complete difficult schoolwork, receiving a disappointing result, imminent deadlines, and clashing due dates. The second type of academic adversity is major adversity. Fewer children will experience this. Examples include poor physical and/or mental health, learning difficulties or disabilities, chronic failure, bullying, suspension or expulsion, changing schools or repeating a grade. A third factor in this area is the capacity to navigate uncertainty, change, variability, novelty, and transition. During any school day, your child will change tasks and lessons, interact with different teachers and school staff, work with different groups of students, and frequently experience new or changing conditions. Children need to be able to adapt to help them deal with these sorts of changes, transitions, and uncertainties. There is growing awareness of the limits of comparative approaches to assessing students. Assessment along these lines typically involves ranking and comparing your child with other children. There is useful information in knowing how your child is travelling compared to other children - but it tends to be narrow information and gives little insight into some important aspects of your child's development. Research shows it is beneficial to benchmark a student against him/herself (not just against other students). This is called a growth approach to academic development. Here, children are assessed against their previous best performance or efforts. There are great motivational and achievement benefits in encouraging a student to compete with him/herself. Teachers play a major role in the goals students set. With teacher and parental support, personal best goals might be something for your child to consider this year. In the initial stages of learning any new skill or knowledge, your child is a novice. Because of this, it is important not to overload them in these early learning stages. Reducing the load on your child involves teaching that is structured, organised in small and manageable tasks, provides clear examples, and is explicit in the content to be learned. It also involves practice and repetition, so that key skills and knowledge can be readily implemented or recalled when needed. This approach is called "load reduction instruction" and describes ways the teacher can reduce the load on your child in the initial stages of learning. As your child develops these skills and knowledge, the teacher then moves onto more open-ended and guided discovery learning approaches. Both explicit and discovery approaches are critical to your child's academic development. It is the sequencing of these that is really important to get right. With core skills and knowledge under your child's belt, high quality discovery learning then follows. The extent to which your child will be receptive to the teacher's efforts I have described here will depend on the relationship the teacher builds with your child. The interpersonal relationship – the extent to which the teacher is interested in, helps, and encourages your child. The substantive relationship – the extent to which your child relates to and is interested in the content of what is being taught. The pedagogical relationship – the extent to which your child relates to the methods the teacher uses to teach. Parents/carers also share a substantial part of the responsibility – and children are greatly assisted when parents/carers and the teachers are on the same page.